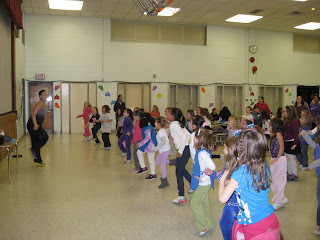 Turnersville, NJ —Fifty Washington Township Kindergartens and First Graders ages five to seven earned a Girl Scout “Strong and Courageous” petal while learning Latin dance party moves with local Zumba Expert Desiree Bowen. To keep the healthy theme moving, the Girl Scouts are currently celebrating their 100th year anniversary by challenging each scout to walk 100 miles over the course of a few months. Girls are given a pedometer to track their steps. Zumba Instructor Desiree Bowen is a member of IDEA Health and Fitness Association. She teaches all levels of fitness through Zumba, Piloxing, and Toning in several locations throughout Washington Township. For more information, or to view her schedule, visit www.zumbadesi.com.